Posted by Sometimes I wish our lovely and nice bosses would give us time off to celebrate Thanksgiving twice.. the Canadian one AND the American Thanksgiving coming up pretty soon. Ah wells, at least it gives me time to type up new recipes I made for Canadian Thanksgiving (and since then) in time for folks to try things out for the US Thanksgiving! Watch the blog next week for how to brine and roast a chicken... and how to scale it up for a turkey! 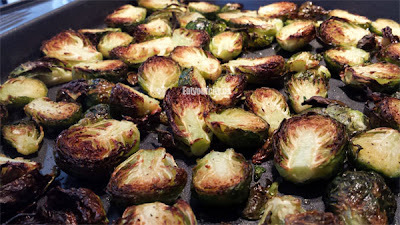 This week its simple sides: roasting crispy chip like Brussels sprouts and tender sweet roasted carrots. 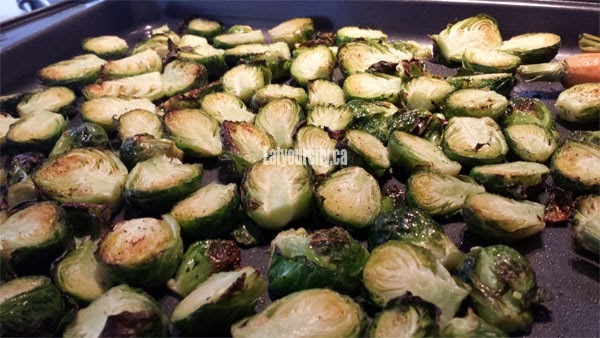 Step 2: Clean your sprouts by giving them a good rinse under the tap, shake off the water and trim off any leaves that aren't nice and green (get rid of the brown icky leaves). Cut them in half. Step 4: Dump veges onto a heavy duty non-stick Wilton's cookie sheets as its nice and heavy duty and super easy to clean up) or foil lined cookie pan and arrange the sprouts cut side up. Step 5: Pop into oven for 20-30 min, turning them over half way through.